A 1978 graduate of Watertown high school, Berkman was an all- around athlete. He went on to play college basketball and lacrosse at St. Lawrence University becoming an All American midfielder in 1982. He coached men's basketball for 3 seasons and was an assistant soccer and lacrosse coach at SLU. He also spent one year coaching lacrosse at SUNY Potsdam in 1985. He was an inductee in the St. Lawrence University Athletic Hall of Fame in 2001. Berkman became the head lacrosse coach at Salisbury (Md.) University in 1989. He will begin his 30th season this year. 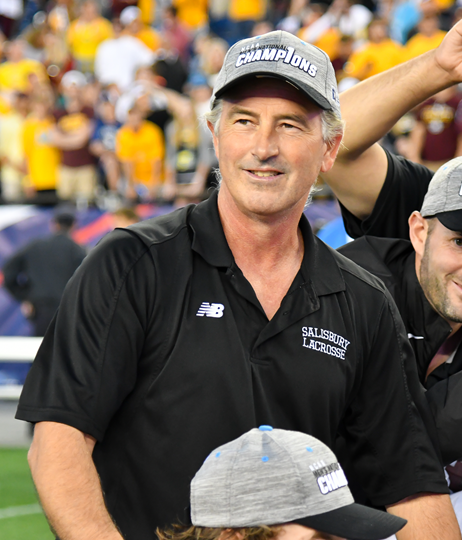 Jim is the NCAA all time wins leader as a men's lacrosse coach. He has a career record is 502-53 (.904 win %). His teams have won 12 national Division 3 titles. He has coached 11 National Players of the Year and 197 All Americans Berkman won his first national championship in 1994 with a win over Hobart College in College Park, Md. Salisbury went 16-0 that season as the Sea Gulls became the first undefeated national champion in the history of the NCAA Division III championships. The following year, Berkman and the Gulls repeated as national champions as they finished 1995 17-0. In recognition of his outstanding resume, Berkman has been recognized as the CAC Coach of the Year ten times (1996, 2002-08, 2010, 2012, and 2016) and was the recipient of the Francis "Babe" Kraus award in 1991, 2008 and 2012 as the Division III National Coach of the Year. Berkman currently resides in Salisbury, Md., with his wife Jennifer. Their son Kylor was a four-year member men's lacrosse team and daughter Keli won a national championship with the Salisbury women's lacrosse team in 2010. The North Country Sports Hall Of Fame is proud to welcome Jim as part of it's inaugural class.